Stamppot (English for "mash pot") is a traditional Dutch dish made from a combination of potatoes mashed with one or several other vegetables, sometimes also with bacon. Left: A close up of stamppot made from endive and potatoes. These vegetable pairings traditionally include sauerkraut, endive, kale (a form of cabbage), or carrot and onion (the latter combination is known as hutspot). It is usually served with sausage or stewed meat. Stamppot can be purchased from shops and supermarkets premade. It can also be ordered in cafe style restaurants. The origin of stamppot is unknown, but it is a widely known Dutch dish and can be a cheap, hearty and filling meal. Stamppot is prepared by boiling the vegetables and potatoes separately. Once done, the potatoes are added to the same pot as the vegetables and all are thoroughly mashed together. Some people add applesauce to this mix for extra flavor and/or to soften the mix. A rookworst is the preferred piece of meat to be added to the dish. Most Dutch people make a small 'pond' of gravy in the middle of the vegetable mix. Stamppot can also be made in a single pot. Potatoes, onions, and the vegetable of choice are peeled and placed in the pot with the sausage. Water is added, and the mixture is left to boil. 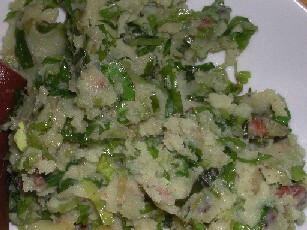 After the vegetables are cooked and drained, some milk, butter and salt are added, and the vegetables are mashed together. An example is hutspot. In several kinds of stamppot people will add some fried bacon bits. In the Netherlands, stamppot is sometimes served with applesauce or gherkins and pickled onions.